Nathaniel Matthews has no time for courting. As the eldest, he has his family's lost fortune to rebuild, and his reckless brother to manage before he gambles his future away. Odd that Nathaniel can think of little but kissing bright-eyed Anne, who seems to be fighting off admirers from all sides. Is it the country air, or is Nathaniel ready to discover that love has a magic all its own? I can't wait to read more from Eileen Richards! 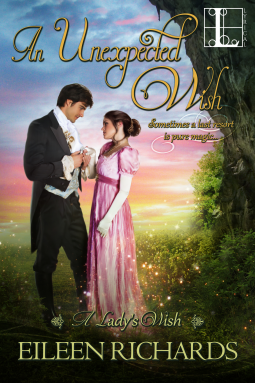 An Unexpected Wish was light, cute and entertaining from beginning to end. It had everything that I enjoy in a Regency Historical - humour, romance and a little bit of suspense. There was so much humour surrounding Anne's sudden predicament; being the centre of unwanted attention whilst simultaneously developing an attraction to Nathaniel with whom she is quite often at odds. I loved Nathaniel in the story. Despite his conflicting feelings about Anne and her family he is incredibly kind, protective and good natured. I enjoyed the banter between the couple and Nathaniel's little piques of jealousy added to the drama. Anne is also a great character. She is strong willed and kind hearted but not as self assured as she could be and needs to be convinced that Nathaniel's feelings for her are real. The sub plot of danger and a threat to Anne and her family lurking in the background added suspense and excitement to the story. An Unexpected Wish is going directly to my 'keep and reread' shelf. It would also make a good title to gift/recommend to your mother or aunt if they prefer their regency romances more along the lines of Georgette Heyer and less on the sensual side.